• Eileen Roche walks you through the steps to making great quilts with your embroidery machine. • Learn Eileen''''''''s patented technique for quilting and appliqueing as you go, then learn how to add custom quilting and allover quilting to your quilts and how to finish them beautifully. • Learn to create six projects including fun and easy table runners, a patriotic pillow, and a child’s play mat. • This book also includes all the machine embroidery files you need to create the projects. Finally! 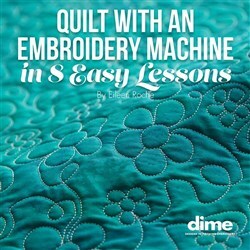 A quilting book for machine embroiderers! Quilt with an Embroidery Machine in 8 Easy Lessons, machine embroidery expert Eileen Roche walks you through the steps to making great quilts with your embroidery machine. Learn Eileen's patented technique for quilting and appliqueing as you go, then learn how to add custom quilting and allover quilting to your quilts and how to finish them beautifully. In addition to the eight lessons, you'll learn to create six projects including fun and easy table runners, a patriotic pillow, and a child's play mat. Minimum hoop size : 6" × 10"
Click Here To Read Eileen's Blog about this product. 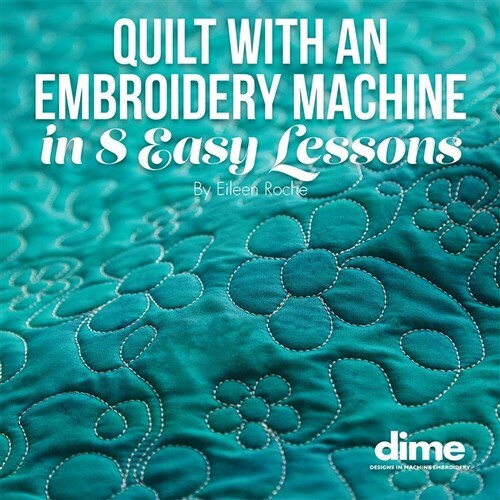 In Quilt with an Embroidery Machine in 8 Easy Lessons, machine embroidery expert Eileen Roche walks you through the steps to making great quilts with your embroidery machine!